From as early as 1338 the Verderers? Court of attachment in Dean was usually held at Kensley House, which stood in the centre of the Forest. A hundred years later, the court held there was sometimes held on Speeches Day. The house continued to be used for the Court, increasingly called the speech court to the early seventeenth century. The site was where Speech House was erected in 1676 and where it still stands today. The intention to build, what is now the oldest part of Speech House, arose in 1669, when representations to the Treasury for a house to facilitate the keeping and holding of forest courts for the preservation of vert and venison, in accordance with the laws of the Forest in pursuance of the Act of 1668. They asserted that Coleford was the most convenient place and the proposal was to erect a Speech House over Coleford town house. Approval was obtained and the King signed the warrant to fund the structure, but the warden of the Forest and one of the Verderers opposed this and urged that the building be placed where the old Speech House stood. The decision was changed and Treasury approved warrants to fell trees for the building and to raise money ( except oaks fit for the Navy were not to be used). The date 1676 was on a stone lintel believed to have been originally over one of the doorways in the stables, transferred to the old northern entrance but then removed when the entrance was blocked in about 1883. A weathered escutcheon dated 1680 has the initials CRII above the west entrance to the courtroom, but there is no proof Charles ever visited Speech House himself. The first recorded use of the newly-built Court was in 1676 when there was a swanimote held before two Verderers. In 1688, the Speech House was seriously damaged during a riot by some inhabitants of the Dean protesting against the inclosures being created ? at the same tame Worcester and York lodges were pulled down by the rabble and absolutely necessary to be rebuilt. In 1858, the Rev.H.G. Nicholls commented that the courtroom retains ?its original character only it has been floored with wood, and is no longer divided by rails into compartments for the jury and the accused?. By this time, Speech House was let by the Crown as an inn, the courtroom being reserved for the Verderers? use as and when required. Major additions to the Speech House were proposed in 1881. The west front of the building is practically in its original state - but east of the slight recess in the north wall all the building dates from about 1883. The original roof line was followed in the new additions and the original stones of the demolished sides were preserved and used in the front of the hotel. In the courtroom an open hearth faces the western wall and at the south end there is a low raised gallery or dais of oak. 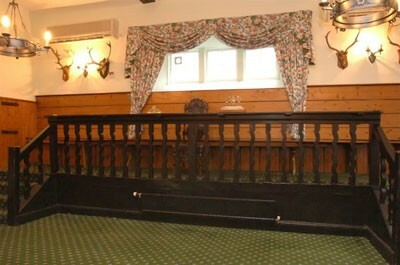 Nineteen pairs of antlers still adorn the walls as they have for centuries. On the east wall lie the two royal spades used in 1957 by HM Queen Elizabeth II and HRH Prince Philip to plant two oak trees over the road from the courtroom. In the Courtroom are the Verderers? brass plaque of the Royal Coat of Arms and the card advertising the Court proceedings. Mabel Beech, a lifelong inhabitant of the Forest and the first female Inclosure Commissioner for decades, wrote the following poem about Speech House. Tranquil, serene, a peaceful place to rest? Long may the Speech House welcome Verderer and guests.